Arequipa is a city in southern Peru and the nation's second-largest city. 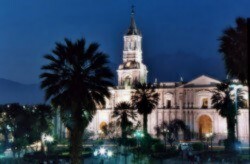 It is also the capital of the Arequipa Region and the Arequipa Province. The city stands at the foot of the snow-capped volcano El Misti, in the highlands. Arequipa has many fine colonial-era Spanish buildings built of sillar, a pearly white volcanic rock used extensively in the construction of the city, from which it gets its nickname La Ciudad Blanca ("the white city"). The city is located at an altitude of 2,380 meters (7740 feet) above sea level, in the Peruvian Andes. This is our selection of Arequipa city and Colca Canyon tours, the most exciting tours and Peru Adventure Travel.